Discovered by NASA in 2014, the Kepler-107 system doesn’t seem to be following the commonly accepted understanding of how a solar system works. The standard model is humanity’s own system: The inner planets are rocky and solid, outer planets are gaseous. This pattern, influenced by how close planets are to their star’s heat, creates another pattern: Planets drop in density as they’re farther away from their star (although they pick up again when they get really far out and freeze solid). Scientists suspect that its density comes from a 70 percent iron core. How’d it get there? Through an intensely violent head-on collision at the planet’s formation, although a series of smaller collisions is also a possibility. There are similarities to Kepler-107c in our own solar system: Mercury, the closest planet to the sun, has a metallic core that covers around 85 percent of its body. 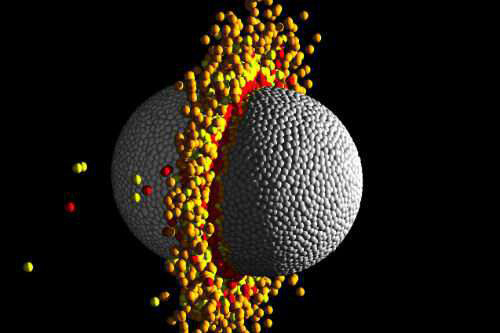 Planet-size impacts are suspected to have occurred in our own solar system as well. The origins of Mercury’s metallic core, for example, is still unknown. As recently as last year, scientists have theorized that a giant collision could have been responsible. The distant Kepler-107c, around 1,670 light-years from Earth, might be able to inform scientists about the formation of Earth’s nearby neighbour. When the European Space Agency’s BepiColombo mission finally reaches the tiny, hot planet, it might be able to answer questions that resonate throughout the universe.